What Size File Do I Need for My Chain Saw? There's nothing quite like the feel and performance of a new chainsaw. But after some time, that newness wears off and you will be faced with a saw that has been worked down to nothing. That is why it's always a good idea to keep an eye on your saw. You don't want to continue working with the chain when it is completely dull. Besides, keeping your chainsaw running at peak performance and your chain sharp only requires a few strokes of the file at regular intervals. 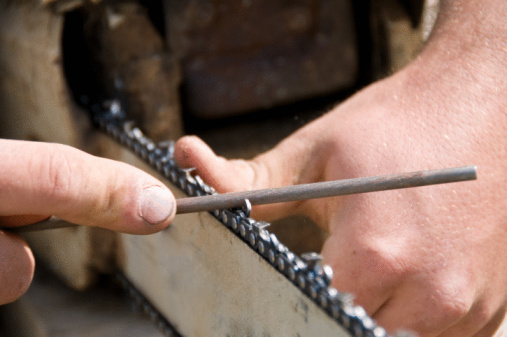 What Tools Are Required For Sharpening a Chain Saw? Your chainsaw should have come with instructions on how to sharpen the chain. Depending on the type of chainsaw, you typically have two options: manually sharpen it or have a professional sharpen it. If you're going to manually sharpen a chain, you will need to purchase a round file that matches the pitch of your chain. You will also need a flat file, which will help you lower the death gauges, and a file guide, which will help you hold the file at the correct height and orientation. Finally, it's a good idea to have a heavy pair of gloves that are manufactured to work with sharp equipment. As far as depth gauges, the easiest way to ensure that you're filing it at the correct height is to use a depth gauge guide. This tool comes in different sizes, so make sure you check the specs on your chainsaw before purchasing one. It's a good idea to adjust the depth gauge every second or third time you sharpen your chain. How Do You Know Which Size To Use? If you're looking to sharpen the saw on your chainsaw, you might be wondering which size file is best. There is a number marked on the side of the cutter of your chain, which is known as your chain type. Once you have this number, you can match it to the file size that is listed on the file chart for the chain. The packaging on new chains indicates all sharpening specs. If you've lost your manual or can't find the information online, you can measure the pitch of the chain. This helps determine the size of the file needed. There are several resources online that show you how to measure the pitch and determine the right size file. Depending on the cutter you are sharpening, you will be using a flat or round file to sharpen your chain. These files are advertised in inches and millimeters but usually come in 4 millimeters, 4.8 millimeters and 5.5 millimeters or five-thirty seconds, three-sixteenths and seven-thirty seconds inch. Sara Lindberg, B.S., M.Ed., is a freelance writer focusing on health, fitness, business, and education. She holds a Bachelor’s of Science degree in exercise science and a Master's degree in counseling.